Time seems to stand still in the town of Dublin. The pace of life in the small town is slow and relaxed on most days. That wasn’t always the case according to Marie Storms, David Hursey and Jane Carroll. Dublin was once a bustling town with a set of train tracks and numerous businesses. One curiosity is how the town got its name. David Hursey said, “I’m told that the wife of the engineer with the railroad was from Ireland and she was homesick. So he allowed her to name the train stops along the way and she named them for places in Ireland.” Hence the names of communities such as Dublin, Duart, etc. At one time, there was a train stop in Dublin. Hursey said he could recall being a young child and the railroad had a spur that went to the peanut plant. Hursey said the train would regularly deliver rail cars to the plant and back them onto the spur. When asked what the biggest asset to the town is, Jane Carroll immediately said, “The Peanut Festival.” The Peanut Festival was begun as an effort to raise funds to build a gym/multi-purpose building for the Dublin School. According to Carroll, at the time there was no gym and the students had to go outside unless there was inclement weather. In 1992, a group of citizens came together and discussed the issue and met with the Board of Education. An agreement was reached and in September 1993 the first Peanut Festival was held. It was deemed a success and the gym was completed five years later. Today, the Peanut Festival continues to grow and be successful. The Peanut Festival Committee now issues college scholarships to high school seniors to assist them with college. As well as supporting the community. The trio said the town also was a place where people could stay overnight. There was once a boarding house in Dublin according to the trio. It was located above the Mercantile Store. The town also had a drug store and an IGA grocery store. There was once a convenience store and gas pumps in the town. David Hursey’s grandfather started Hursey’s Woodwork Shop. David is the third generation to operate the shop. The shop is in its third building now and is thriving. The original building stood on the grounds of the current shop but was located further back on the property. 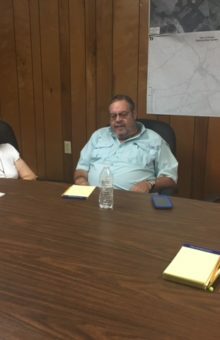 Hursey said he eventually asked the fire department to help take down the original building as it had become a hazard on the property due to age and deterioration through the years. Hursey said the Woodwork Shop has also burned in the past. A fire nearly destroyed the facility several years ago and left the second building heavily damaged. Hursey said the shop was rebuilt and is still turning out cabinets and other wooden items. Hursey recounted when the town purchased its first fire truck. It was a used 1951 fire engine. The town also has had a police department in the past, though there is not one located in the town today. The greatest change to the town was the widening of NC 87. 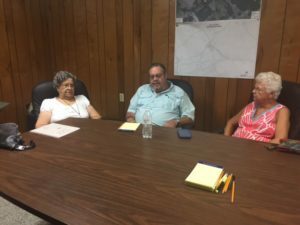 The group agreed that the widening of NC 87 has brought change to the town in the form of increased motor vehicle traffic. The town’s post office is unique in that they do not have a rural route service. Mail is placed in boxes in the post office. The post office is currently in its third building, which is located at 86 3rd Street. There were also several restaurants in the area as well as several gas stations and a bank. The former Bank of Elizabethtown had a branch office located in Dublin which was eventually taken over and operated by Wachovia. It eventually closed and Progressive Bank came to town for a brief period before it too closed. The town now has no bank.